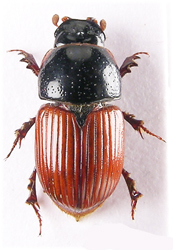 In common with other families of the Scarabaeoidea these possess the terminal asymetric lamellate antennal segments obvious from the examples below. 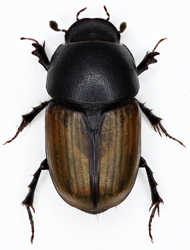 These form a tight club (cf Lucanidae) although they can be splayed in life, a function readily observed in male chafers. Antennae 9 segmented (cf Geotrupidae) and not geniculate (cf Lucanidae). 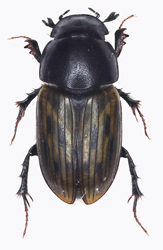 Elytra smooth between striae (cf Trogidae) and entire although the abdomen protrudes beyond the apices in the chafers. Epipleurs narrow and not continuing to elytral apex. Front tibiae with 3-5 teeth and all tarsi 5-segmented, simple. 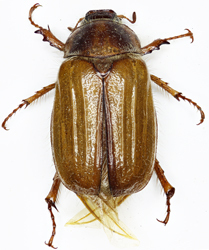 Six visible abdominal sternites (cf Trogidae), the chafers Serica and Omaloplia (Sericinae) have only five visible ventrites, the first being covered by expanded coxal plates. Searching herbivore dung is the easiest method of collection although many can be netted as they come to freshly disturbed or laid dung. 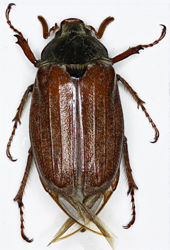 Chafers may be seen at flowers, in flight either diurnally or at dusk, or can be attracted to M.V. light. Occasionally some may be encountered in great numbers. 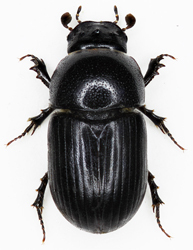 Eleven subfamilies are represented in the UK with 86 species known or supposed to have occurred, of these over half (49 spp) are members of the genus Aphodius. 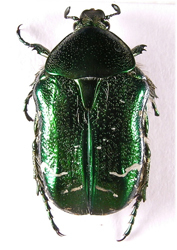 Scarabaeid identification is dealt with by Jessop, Britton and Joy are useful but species have been added to the British list since their publication. 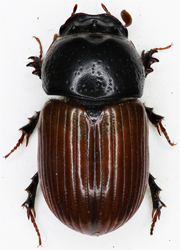 With the large genus Aphodius it is useful to have all three works as their different ways of dealing with the group can be advantageous. 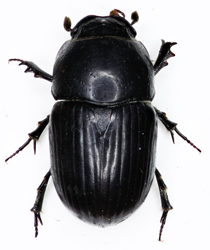 Includes two genera and three species, all formerly included in Aegialia. These are usually associated with decaying vegetable material on dry and sandy soil. All are local;Aegialia arenaria (Fab.) and A.rufa (Fab.) are maritime, Psammoporus sabuleti (Panz.) is found around sandy river banks. 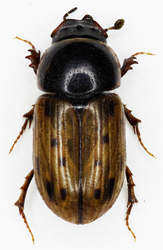 Small beetles, 4-5mm., elongate with the elytra covering or almost covering the pygidium. When viewed from above the labrum is visible in front of the clypeus and the eyes are not visible. 62 species included in 11 genera. 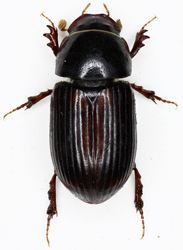 49 species of Aphodius are found in various types of dung. 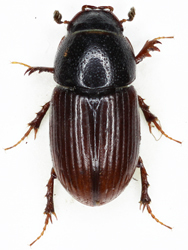 Oxyomus sylvestris (Scop.) is a local spring and autumn species from England and Wales north to Yorkshire, generally from rotting vegetable matter and carrion. 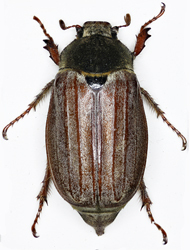 Heptaulacus testudinarius (Fab.) is very local in sandy places across south east England in decaying vegetable matter and dung in the spring. 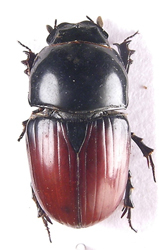 Euheptaulacus sus (Hbst.) 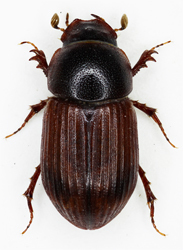 is very rare from southern England in dung on dry and sandy soil. 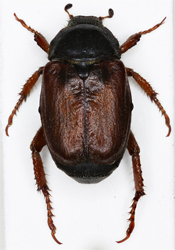 E.villosus (Gyll.) is widespread but very local in dung and vegetable matter. 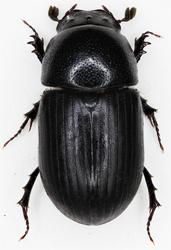 In species of this subfamily the eyes are visible from above but the labrum is not visible in front of the clypeus. 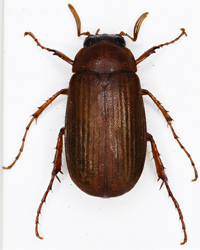 Pronotum smooth i.e. without sculpture but for tubercles or depressions in males. Hind tibiae with two transverse ridges on outer face, the longer terminal spur is shorter than the first two tarsal segments together. Elytral margins straight. 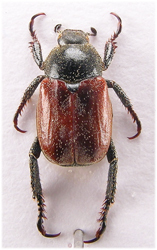 Saprosites contains two species; S. natalensis was added to thr british list in 2003, S. mendax (Blackburn) was introduced accidentally from Australia and is now established in the southeast. 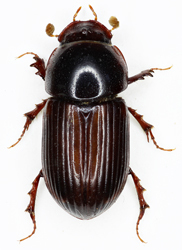 Reported from Dorcus and Sinodendron burrows ¹ and under bark (Joy). 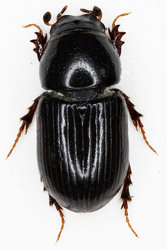 A small, 3-3.5mm., shiny black species with red appendages and strongly punctured striae which are as broad as the interstices. Hind tibiae with transverse ridges and terminal spur layer longer than the first two tarsal segments together. 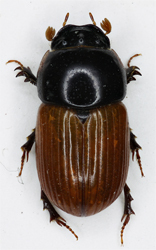 Lateral margin of elytra strongly sinuate before middle. 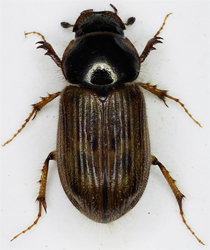 The remaining genera contain small species, 2.7-4.3mm., elongate beetles with entire elytra, and pronotum with transverse ridges and depressions. The eyes are visible from above. 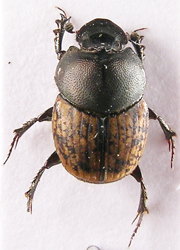 Brindalus porcicollis (Ill.) is now extinct and Pleurophorus caesus (Creutzer), a western maritime species, is known only from old records. 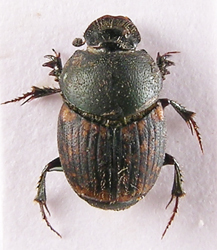 There are old records of Rhyssemus germanus (L.) from around the Severn estuary among decaying vegetable matter on dry sandy soil. 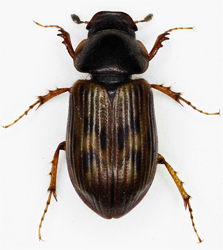 Diastichus vulneratus (Sturm) is a very rare beetle from Sussex, found under stones or among moss or vegetable matter around rabbit burrows. 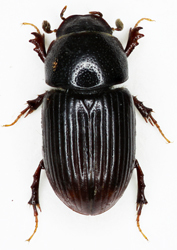 Psammodius asper (Fab.) is a very local maritime species. 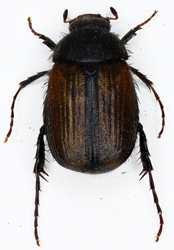 Tesarius caelatus (LeConte) was first found in Britain in 1976 ² and is now a very local maritime species. 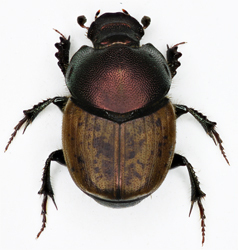 Includes two British genera identified by the hind tibiae bearing a single terminal spur. 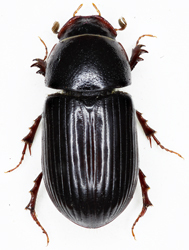 Our single species of Copris, C.lunaris L. (14-20mm. 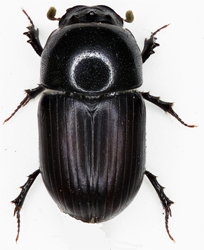 ), a shining black beetle has nine longitudinal striae on each electron. 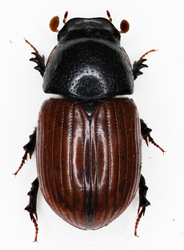 It is a rare southeastern species associated with cattle dung on sandy soil. 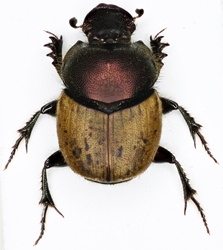 Onthophagus contains eight British species of small (4-11mm) dung beetles, these are either uniformly black or dark with pale elytra. Typically from dung but also common in large rotting fungi and carrion. Several species are common and widespread. 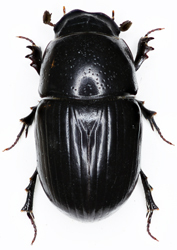 Members of this subfamily tunnel beneath dung constructing vertical burrows with lateral branches into which pellets of dung and an egg are deposited. 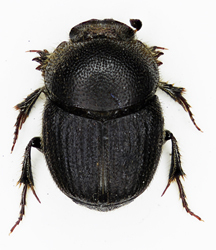 Includes Hoplia, Melolontha, Amphimallon, Serica, Omaloplia and the occasionally recorded adventitious species Polyphylla fullo (L.) which has never been established. 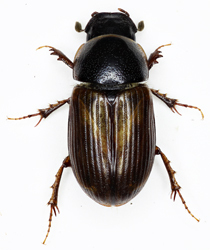 Distinctive species with claws equal in length and each with a lateral tooth. 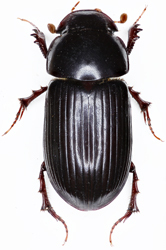 Contains species with two unequal claws in the posterior tarsi. Anisoplia agricola (Poda) is known only from old records. 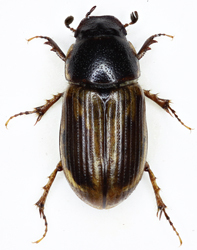 Phyllopertha is featured and Anomala dubia (Scop. 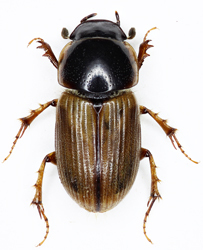 ), the Dune chafer, is a local, mostly southern maritime species. 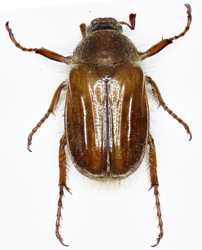 Very distinctive chafers, all are rare although Trichius fasciatus (L.) is widespread. 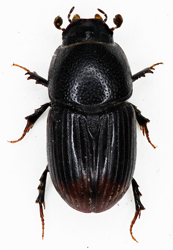 T.zonatus Germar is doubtfully British. 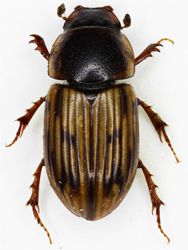 Gnorinus nobilis (L.) and G.variablis (L.) are southern english species. 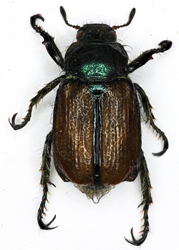 The other two genera contain bright metallic species found on flowers in warm weather. 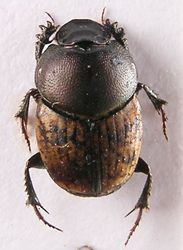 Two species; Protaetia cuprea (Fab.) 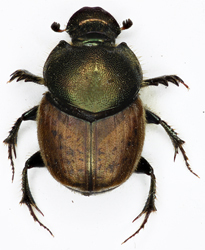 from northern England and Scotland, and Cetonia aurata (L.), the Rose chafer, from England and Wales, very rare in the north and southern Scotland.